Foster volunteers play a vital role for the Edmonton Humane Society. These volunteers open their hearts and homes to animals who are not yet ready for adoption. Help Save Animal Lives – Become a Foster Parent! Foster volunteers play a vital role for the Edmonton Humane Society. These volunteers open their hearts and homes to animals who are not yet ready for adoption. Animals who require foster care may be too young for adoption, sick or injured, need specific behaviour therapy, or perhaps just a quiet place to lay their heads. Some pets are very stressed at the shelter and do much better in a home environment, allowing their true personalities to come out. The foster program also opens up space in the shelter, freeing kennels to house and care for even more animals. Foster volunteers provide temporary care in their homes until the animals are ready for adoption. The length of stay in a foster home can vary anywhere from two weeks to two months. Over 1400 animals benefit from foster care each year; spending time in a loving home environment sets them up for success in their future adoptive homes. The EHS provides all supplies and veterinary care; foster parents provide much needed TLC and basic care such as feeding, exercise, grooming, socialization, and occasional medication administration (full instructions provided). Help an animal in need. Hi! My name is Lacey but you might remember me as Sophie. I have been in my new home for six months now so I wanted to give you a progress report. I am so lucky to have been taken in by the Edmonton Humane Society. Initially I was terrified but they found me a wonderful foster home where I lived for about nine weeks as I started to gain confidence & trust. When they felt I was ready, the search began for my new home. The stars aligned & I was chosen by my new Mom & Dad & my canine brother. Here I am learning how to be a little dog who enjoys life. Mom says I am still a work in progress but I have come so far already. Would you believe I hardly knew how to play but my brother & I are having fun. I am even learning to play with toys. Who knew about treats! I am just starting to accept how delicious they are & my Mom & Dad like to reward me for lots of little things that I now do. I get very excited to go for walks when my leash appears. 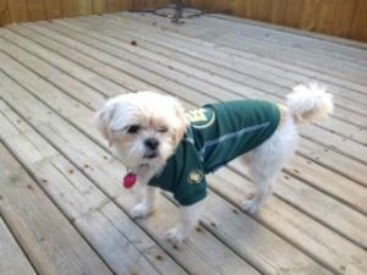 As you can see from the pictures I am sending that I am an Edmonton Eskimos fan. I love any TV shows with animals but my favourite show is the Incredible Dr. Pol. I want to thank the Edmonton Humane Society staff & especially my wonderful foster family for giving me my second chance. I love my new life & I know my new family love me. I even heard Mom say that I am her dream dog but shhhhh…. I don’t want my brother to feel badly if he hears that. © Copyright Edmonton Humane Society. All Rights Reserved.